Former South Korean President Park Geun-hye has been sentenced to an additional eight years in prison for abusing state funds and violating election laws. She now faces more than three decades behind bars. Park, 66, has denied wrongdoing. She didn’t appear in court for the sentencing. 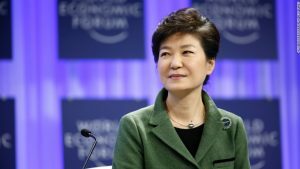 Park became South Korea’s first democratically elected leader to be forced from office. She was impeached in December 2016 and was formally removed from office following a ruling by the country’s Constitutional Court last March. She was arrested weeks later on charges including bribery and abuse of state power. The scandal exposed a web of corruption between political leaders and the country’s powerful conglomerates. She was sentenced to a 24-year prison term over the scandal. For the latest charges, the Seoul Central District Court found her guilty of causing substantial losses to state coffers. The court ruled that Park colluded with her former aides to pilfer about 30 billion won ($26.5 million) from the National Intelligence Service (NIS). The money was from a “special activity fund” allocated to the spy agency. The three former NIS directors involved were sentenced to prison terms last month. Those charges resulted in the court sentencing Park to six years in prison and ordering a fine of 33 billion won. Prosecutors had sought a 15-year sentence and an 80 billion won fine. It was immediately unclear whether Park would appeal. Park also received an additional two year prison sentence after being found guilty of interfering in the ruling party’s selection of candidates ahead of the parliamentary elections in 2016. The court found that her actions breached the president’s obligations to remain politically neutral. For all of the charges she has been found guilty of, Park is facing a total of 32 years in prison. According to the court, all sentences must be served consecutively. Her prison term could potentially get even longer, depending on rulings of appeals courts.